Csonka rushed for 2934 yards in college and was a consensus first-team All-American in 1967. He was chosen by the Dolphins in the first round of the 1968 AFL/NFL draft (eighth overall) but, with a poor team, was undistinguished in his first two seasons. Csonka suffered a severe concussion as a rookie, when he rushed for 540 yards, and missed further time to injury in 1969, ending up with 566 yards on the ground. The arrival of new Head Coach Don Shula for 1970 brought about a significant turnaround for both the team and Csonka. Dolphins went 10-4 to finish second in the AFC East and qualified for the postseason as a Wild Card while leading the conference in rushing yards (2082). Lost AFC Divisional playoff to Oakland Raiders (21-14). Csonka, a classic power-running fullback with speed and a punishing style, continued to excel for the Dolphins. He gained over a thousand yards rushing in each of the next three seasons, twice averaging over five yards per carry, and Miami won AFC titles in each of those years as well as two Super Bowls, going undefeated in ’72. His crowning achievement was a 145-yard rushing performance in the Super Bowl VIII win over the Vikings that earned him game MVP honors. While Csonka ran for 749 yards and 9 TDs in 1974 and was selected to a fifth straight Pro Bowl, he, along with teammates HB Jim Kiick and WR Paul Warfield, had already committed to jumping to the World Football League in 1975. Csonka gained 421 yards in seven games with the Memphis Southmen before the league folded and he returned to the NFL in ’76 with the New York Giants. He had three lackluster years with New York, never gaining more than 569 rushing yards in a season or averaging better than 3.6 yards-per-carry. He returned to the Dolphins for one last year in 1979 and returned to form, gaining 837 yards and scoring a career-high 12 touchdowns. Overall in the NFL, Csonka rushed 1891 times for 8081 yards, which ranked sixth all-time at the time of his retirement, for a 4.3-yard average with 64 touchdowns and caught 106 passes for 820 yards with another four TDs. 6737 of those rushing yards came with Miami, making him the franchise’s all-time leader. In 12 postseason games he added another 891 yards and 9 TDs on the ground and also had a scoring catch among his four pass receptions. 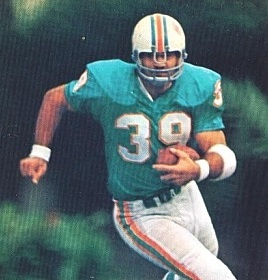 Csonka received consensus first-team All-NFL recognition three times, garnered All-AFC honors after one other season, and was selected to five Pro Bowls. The Dolphins retired his #39 and he was inducted into the Pro Football Hall of Fame, Class of 1987.